When I walked into the 'Arrivals' building on the Syrian side of the border (with Jordan) I met two Americans who had been sitting there for quite some time, waiting to hear if they'd be given a visa or not. "They've faxed all our details off to Damascus to get a decision", said Andrew, a freelance journalist from New York. "We're hopeful, but I guess nothing's for sure yet". The immigration officer for foreigners thankfully turned out to be wearing a smile (which I've since found out is pretty much the norm for Syrians - they're universally extremely friendly). I think it helped when explaining my circumstances that I was covered in sweat from the ride over the hill from the Jordanian side, and he could see my bike parked just outside the doorway. 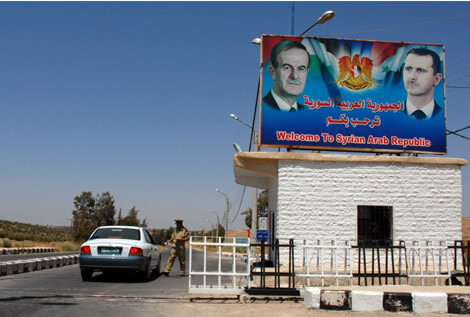 "The Syrian embassy in Amman wouldn't give me a visa" I explained. "They told me that I have to go back to my country of residence - the UK. But I've been traveling for 13-years and I don't have the time or money to go back to England just for this visa. Can you please help me?" "I will try" he muttered while starting to leaf VERY slowly through my passport, meticulously checking each stamp for even a whiff of the evil neighbour, Israel. When he got to the section with the Egyptian and Jordan stamps he went back and forth a few times trying to make sense of the mishmash of entry and exit stamps between Nuweiba (on the Egyptian side) and Aqaba (on the Jordanian side). Fortunately the deliberate smokescreen seemed to work and he didn't ask the one question I was dreading - how there ended up being two entry stamps for Egypt and only one for Jordan? Evidently the two days and $160 US spent going back and forth between Aqaba and Nuweiba had been worth it after all, and twenty minutes later I was walking out the door, passport in hand, and with the needful Syrian stamp inside. The poor Americans were still sitting there. What this means is that we are now able to officially publicize the COMPLETION DATE of Expedition 360 - Saturday October 6th this year. After riding through Turkey, Bulgaria, Romania, Austria, Germany to Belgium the final crossing of the channel in pedal boat Moksha will be completed over 3-days from 2nd-4th October (weather dependent as always). The arrival at the Greenwich Rowing Club slipway will be at 10.30 am at high tide slack water on the 6th. 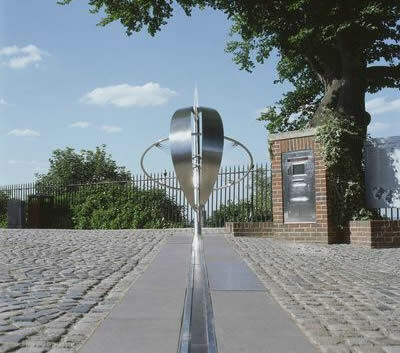 After lifting her out onto a mobile trolley a group of close expedition team members and supporters will push her up the hill to the Royal Observatory for the final crossing of the zero degree line of longitude. This is represented by a strip of brass embedded in the cobblestones, the same that Steve and I crossed over on our outward bound journey 13-years ago. One may ask, 'What's all this business about pushing a boat up a hill? 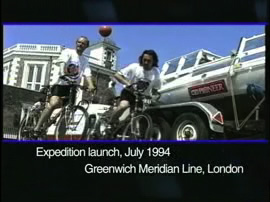 Why not just Jason cross as he's the one completing the full circumnavigation'? Well, firstly the pedal boat is one of the things that makes this expedition as unique as it is: custom designed, custom built and still going strong after all these years. She's suffered many near fatal accidents, from colliding with a coral reef outside the Turks and Caicos Islands in 1995, to being rear ended in a traffic jam going to a school presentation in Colorado in 1996, to capsizing and nearly sinking in a storm off Morro Bay, California in 1998. And yet she has faithfully delivered every crew member who has ridden in her safely to the other side of every piece of water she has been asked to cross. Moksha is as much a part of the team as any of us, and you never leave a team member behind. Second, the people who will push her over the line with me are the heart and soul of the expedition, those who have worked tirelessly behind the scenes over the years to cover a myriad of tasks that couldn't have afforded financially otherwise. Aberdeen Asset Management have assisted financially since June last year, but for 12 years prior to this it was only through the energies of the individual people we met along the way that the expedition was able to move forward. These people got roped into Steve's grand idea much like I did as one of the earlier team members. So it will give me immense pride to be with them at at the last. ALL ARE WELCOME! Details of directions and maps will be posted nearer the time. But this should hopefully be enough lead-in for anyone planning on coming from abroad to start thinking about travel arrangements.